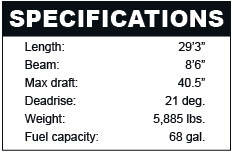 This full-sized bow rider is loaded with a laudable array of standard features. One of the more interesting trends in boatbuilding that evolved roughly a decade ago was the advent of the big bowrider. They haven’t gone away, and for good reason. 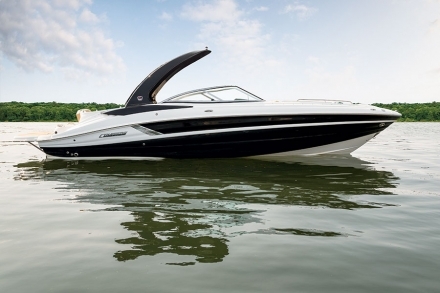 Azure’s big AZ298 is equipped with a lot of features that would be options on other boats. A large bowrider provides the room you need to bring along a lot of friends without having to resort to buying a deckboat, which—let’s be honest—are known more for their utility than their beauty. The continuing popularity of the bow rider proves that there are boaters out there who still value function, but aren’t willing to give up form. 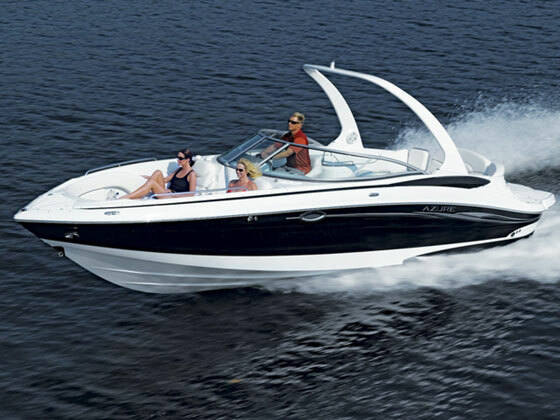 Second, the boat is very well-equipped given its reasonable price tag. For example, the AZ298 comes standard not only with a bimini top, but also canvas bow and cockpit covers. 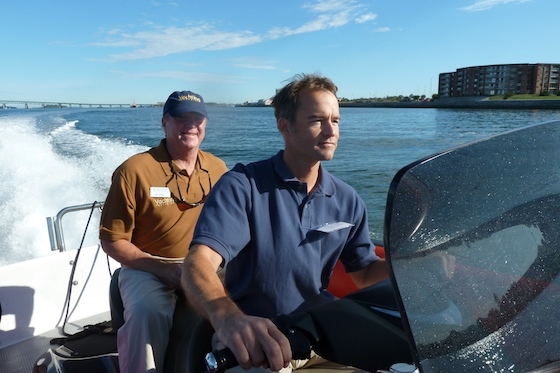 A boater really needs a bimini and covers, so they should be standard on all boats, but that’s not always the case. 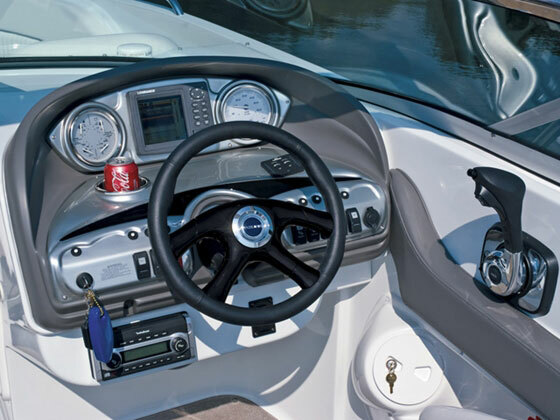 The helm station hosts a full suite of instruments – including a depthsounder as standard equipment. It’s uncommon that a boat would come standard with such niceties as a stainless-steel scuff plate at the bow eye or an extended swim platform with LED lighting, or recessed halogen docking lights. In addition, it’s not every day you get a 12-gallon pressurized freshwater shower or a convertible three-position rear sun pad and a wet bar in the cockpit. Amenities are nice, but there are some nifty practical touches on the AZ298 that demonstrate the thought that went into this product. For example, pull-up cleats make rope tending for water sports easier because they don’t snag tow lines. Pull-up cleats also mean fewer stubbed toes. Another sign of forethought: The rear ladder extends from the starboard side of the swim platform—away from the sharp propeller blades—and conceals beneath a hatch. The hatch is fitted with a latch so it won’t fly open at speed, and fitted with rubber gasketing so it doesn’t rattle. Similarly, the boatbuilders didn’t have to provide an iPod holder, but they did, which means your music player won’t be bouncing around in a cupholder. Also, you might not think you need a light in the engine compartment, but anyone who’s had to hold a flashlight in his mouth while working with both hands around the engine knows that a fixed light is nice. And if winterizing should take longer than you thought it would, that light might just let you finish the job after the sunset. The cockpit bar area is well thought-out, with stainless-steel drink holders and surrounding rail, and no hip-bruising corners or edges. Those features are the icing. The cake lies in the cockpit, which has gobs of sole space and three large stowage lockers underneath. To port, the L-shaped lounge conceals more stowage and a 48-quart cooler. 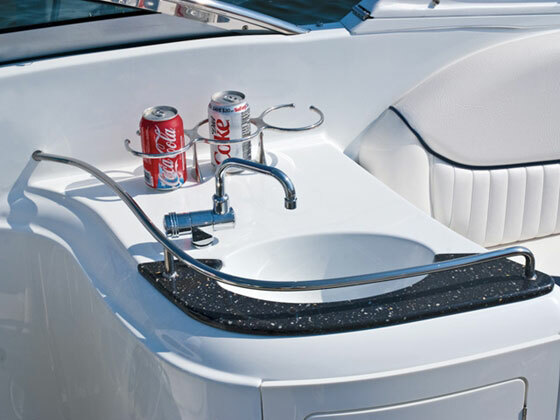 To starboard, the wet bar is fitted with a grab rail, cupholders, and more stowage. 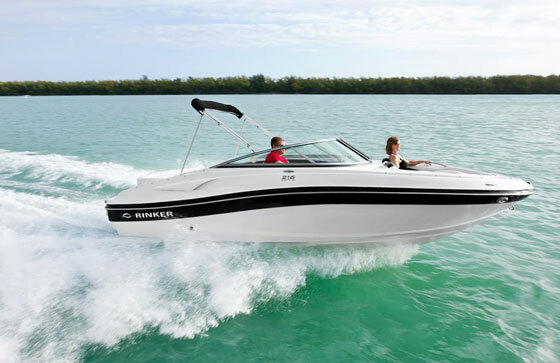 At the helm, the AZ298 comes with dual open-back helm seats with a suspension system and flip-up bolsters. All the requisite instrumentation is in place, plus a standard depthfinder and hour meter. To starboard, the AZ298 comes with a head compartment with its own port. Ahead of the windshield, which is fitted with a wind dam and a magnetic strip to keep it closed in rough water, the bow section is actually a place where adults can sit comfortably. The lounges are sculpted like a convertible bed, with a gentle rise in the thigh and calf bolsters. They also have armrests built into the side coaming panels and flip-down armrests in the center. Considering the AZ298’s solidly-built, stepped hull, 5,885-pound weight, fast design lines, and 320-hp standard powerplant, DeBar’s statement doesn’t sound like marketing-speak. 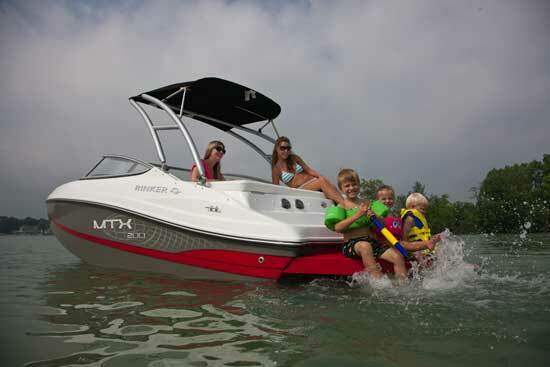 Boaters looking for big, comfortable, well-equipped bowrider should focus on this Azure offering. 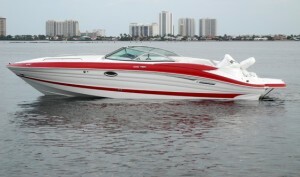 For more information, visit Azure Boats.